Earlier this week, a study came out linking moderate and extreme picky eating with anxiety and depression in children. It has caused quite a stir in the media, with headlines like, “Is picky eating causing depression?” That grabs attention! With one in three parents describing their child as “picky” at some point, the reporting on this study has probably caused more anxiety. Quick answer, no, typical picky eating, which impacts one in three kids at some point, does not lead to depression, anxiety or ADHD, nor was it associated. A small percentage of children have severe or moderate selective eating which were the two groups associated with anxiety and other concerns. Of note, this study, like all studies had some limitations. Among them, it was voluntary (meaning some parents opted not to partake which could alter findings), and the study followed a portion of the children for a few years, not to adulthood, and didn’t take into account how the challenges were addressed among other factors. The study itself doesn’t claim that picky eating causes depression, another example of how the media distorts science. Here is a nice summary of the study, and below are some more thoughts that we (Jenny and Katja) had on the issue to help parents unpack these scary headlines. IS picky eating causing anxiety and depression? Do you see anxiety in children with more severe picky eating? This study found a correlation, not causation, between moderate to severe picky eating and other conditions like anxiety and ADHD, which has been suggested in other research. It does not mean that picky eating causes depression or anxiety or mental health problems, but it does reinforce that we should take parental concerns about eating seriously. Here are our thoughts. Jenny: For the severe selective eating (SE) group like that described in the study, it is absolutely true that the children are more likely to have oral-motor or sensory issues that contribute to their selectivity. With regard to the issue of the correlation with maternal anxiety, did the mother have these problems prior to having a child with SE? 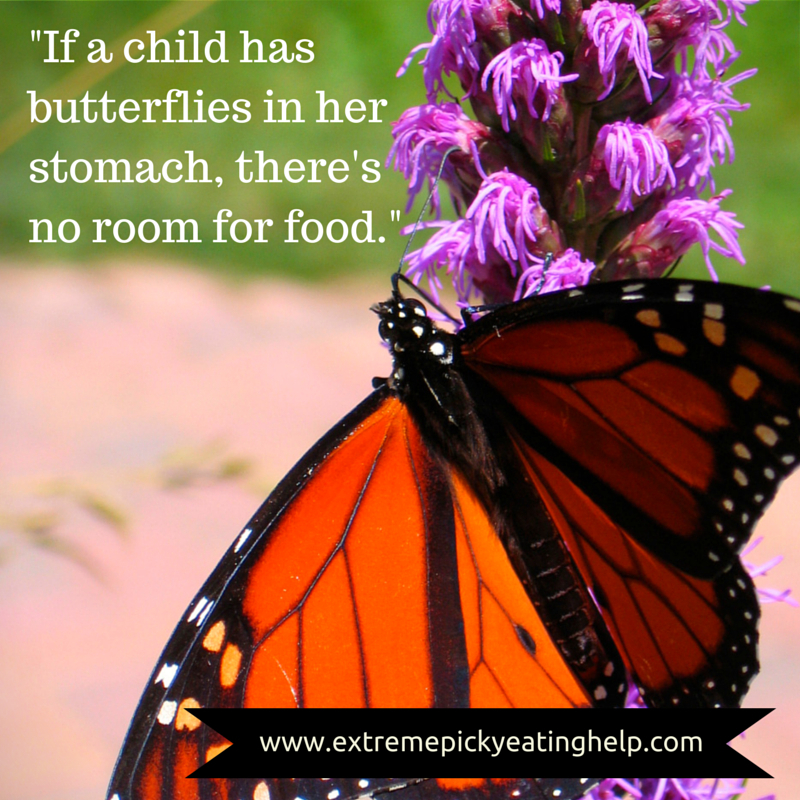 It is hugely stressful to have a child that struggles to eat, so this is an important distinction. If the mother was already exhibiting significant anxiety, is there a genetic component to her child’s anxiety, and/or if she is generally anxious, is the parent unable to sensitively and responsively meet her child’s needs at the time? This all flows over into fears about the child’s eating. Food is ubiquitous in our social world- children can’t get away from it, so it would follow that they would have anxiety much of the time. So whether or not the child truly has an anxiety disorder is confusing when you look at it from that angle. I’ve seen many children whose whole personalities changed when the anxiety around food was gone. For the families I see, generalized anxiety plays a large role in the child’s issues with food. But an interesting thing happens when the anxiety around food is decreased or goes away within a trusting feeding framework; the child is often able to relax and engage more in activities that previously were avoided due to anxiety about food. Katja: We also have to remember that temperament and the child’s personality traits are mixed into this picture as well which wasn’t really part of this study. In general, a child who is more cautious, or has a more sensitive or spirited temperament (Raising Your Spirited Child has a nice discussion) is more likely to be cautious and sensitive around new foods. A child who observes for a long time before jumping in, is slower to warm up to new experiences, or prefers things the same, may be the same way around foods. A child who so much wants things done “my way and on my time” may not appreciate efforts to try to get him to eat more or different foods. We often have parents relate that they have two or more children, and only one is particularly picky, and that child is also in general more cautious or anxious, or strong-willed and independent, not necessarily to the point of it being a problem, but just part of the child’s personality. How parents react and support children can make a big difference. If a child is pressured, shamed or coerced, things can get worse rather than better, as typical picky eating usually does around Kindergarten age. What about doctors and their role? Jenny: I have trained physicians on what the red flags are and when to refer their patients for an evaluation, but I usually only get 45 minutes! For the most part, parents are told that “a child won’t starve himself” or “she will eat when she is hungry”, which is not the case for many of the children I see. One of the main problems for very young children is that first time parents don’t know when something is out of the ordinary, and clinicians don’t know often what questions to ask and never observe a feeding. 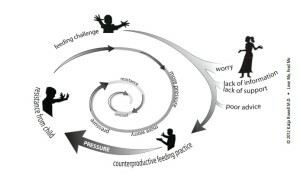 So a vicious cycle can begin where the child has a feeding challenge, the parents get anxious and pressure, they ask for help and possibly get bad advice, they pressure more because nothing is improving, and the child pushes back. For children who are older, physicians frequently dismiss the parents’ concerns if the child is growing adequately. This is disheartening to parents because they know that it is more difficult for them than other families, yet the trusted medical professional doesn’t understand. Katja: I agree. Most of the time, parents tell me their primary care doctors felt this was just a phase, even with signs that with some digging pointed to a picture that was clearly beyond typical eating. Doctors (myself included during my medical training) get virtually no information on typical development around eating, much less how to screen and support parents. What is worse is when physicians give bad advice. I’ve heard some of the worst advice, like, “He’ll be fine if he doesn’t eat for three weeks” come from a physician. We’re glad that this issue is getting some press. We would like to see parents of children along the spectrum of picky eating get support, or knowing what to anticipate even before there is a problem. Clinicians need training to support parents with concerns, screen for challenges and offer education, intervention and referral as appropriate. Some very common feeding challenges, such as when around 9-10 months some infants “refuse” the spoon, can be handled well or can devolve into a bigger problem. (Hint, let the child have a spoon, or skip the spoon and let him finger feed rather than getting into battles or trying to make him take the spoon!) Simple interventions can get many infants and toddlers back on track! There is a lot of bad advice out there though, so getting the right information is critical. Reassurance is an important role of the clinician, but they have to ask questions and reassure only after problems have been ruled out and if the picky eating is truly more typical than extreme. The nice thing is that this study confirmed what we are seeing in practice. Parents need help on specifics around reducing anxiety and breaking those neural pathways that associate food with fear and a loss of control for kids— and for parents! We wrote our book Helping Your Child with Extreme Picky Eating to help parents understand the origins of challenges and how to help. This is especially critical since doctors aren’t often trained to do so. Our book outlines our STEPS+ approach, which is a uniting of our (Jenny McGlothlin runs a feeding program, and Katja Rowell consults with parents) work. We focus on issues discussed in this study: reducing anxiety, reducing family conflict, and specific ideas on how to help a child with sensory challenges like how to bridge to new flavors and textures. Importantly, how to have the whole family at the table, enjoying meals and enjoying each other is a central goal! When parents are dealing with toddler tantrums or a child who won’t even come to the table, they need support around how to make those family meals happen. Parents need to know also how to support nutrition and growth when that is their big worry. We also review how parents can find the right help to address oral-motor and more severe sensory challenges. Bad therapy can be worse than no therapy at all.